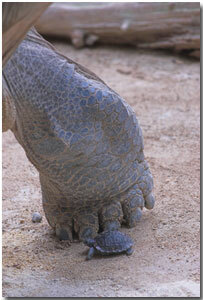 When a galapagos tortoise in the wild hatches, it's on its own. Not only is it in danger for its life, it has no family support. A new baby at the Zurich Zoo has a different experience. 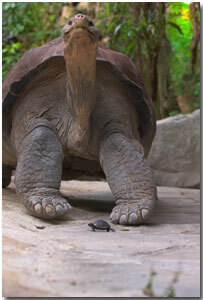 Of course the Zurich tortoise gets the help and protection of specialists in tortoise care. But it also gets to pose for family photos. 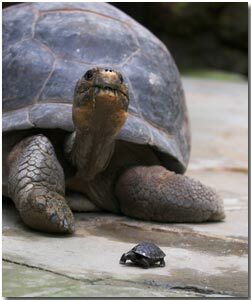 Like other reptiles in the wild, the galapagos tortoise lays eggs. Then it goes away. 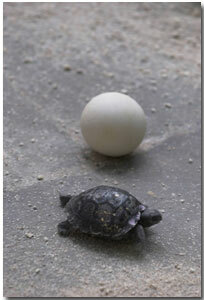 The eggs hatch and the hatchlings make what life they can on their own. Parents and offspring probably meet up later, but neither the parents nor the babies know which baby belongs to which mother. In the zoo, keepers know exactly who the mother is. 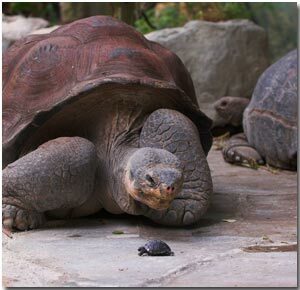 So, when the eggs of Nigrita, a 70-year-old galapagos tortoise who had been living at the Zurich Zoo since 1946, hatched, everyone knew exactly which baby belonged to which mother. Dr. Samuel Ferrer of the zoo sent these family album photos for you to enjoy. The photos are real, but I made up the comments under them. The comments are just for fun. I hope you enjoy them. Zoo Zurich" Is this one of my siblings? Nah! My siblings would be 12 inches deep in the nest. This must be one of those spoiled eggs. Yuck! A spoiled egg is nasty. A spoiled baby tortoise, on the other hand, is a wonderful thing. I heard that my eggs have hatched. Now, is this one of mine? Seems to be a slight family resemblance. I want you all to meet my newest baby. Isn't this a fine specimen? Any one who wants to apply as a babysitter, just line up on the left. I'll check your credentials and get back to you. Yay! I won the babysitting contest. See what good care I'm taking of this baby? Hey, wait a minute! Where'd everybody go? Tell that mother to come back here soon. I got things to do, too, you know!